Your family members and friends will be moved once received handmade crochet gift from you . Thanksgiving day is coming,don't hesitate to buy this crochet hooks set and make some weave projects sweat hat for your family members . Christmas day is coming,don't hesitate to buy this crochet hooks set for your grandmother ,mom , neighbors and all friends who like crocheting . These crochet hook and needles are not for kids , please keep it away from the little children ! 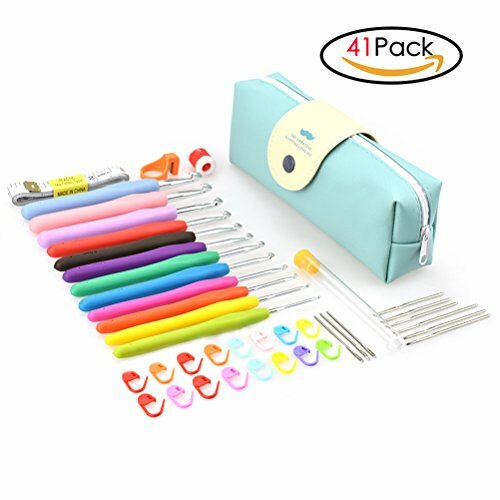 【IDEAL TOOLS For CROCHETING】Package include Crochet hooks, steel blunt needles, mark pins, soft tape measure, row counter,ring cutter and Storage Bag ,it's has everything you need to get crocheting . 【PRACTICAL AND EASY OPERATION】12pcs crochet hooks have 12 different colors , the size 2.0 - 8.0mm are color code make it easy to distinguish. each hook has an enlarged grip, you could easy to use. 【EASE FINGER FATIGUE】The handle of crochet hooks are made of rubber and meet ergonomic design, it's comfortable to use and ease hand pressure. If you have any questions about this product by MOOD SHOP, contact us by completing and submitting the form below. If you are looking for a specif part number, please include it with your message.